The Top/Bottom 2 Boxes & 3 Boxes Advanced Analysis Reports in SIMS Sensory Quality Panel Software Cloud Systems summarizes the extreme observations for Hedonic Attributes. Market research studies often refer to positive and negative rating measures using the Top/Bottom 2 Boxes & 3 Boxes percentages as indicators of consumer acceptance. Special thanks to Mr. Thomas Carr who was instrumental in the development of the proper specifications for statistics that were incorporated in all Top/Bottom 2 Boxes & 3 Boxes reports. Some of these statistic specifications are discussed below. 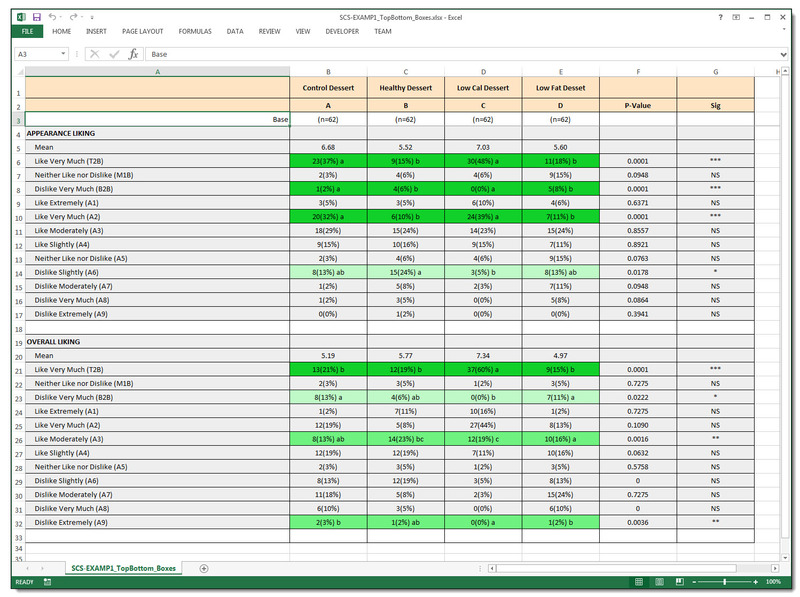 Print Screen of the Generated Excel Direct Report. Print Screen of the Generated Analysis Table - Ready for Sending to MS Word. Print Screen of Main Report Selection Form. Print Screen of Main Report Selection Form - Optional Hedonic Question Selection. Text Version of Analysis Table Report also showing with other selected options. Notes that will be available by Clicking the 'Notes' Button on Main Report Form. 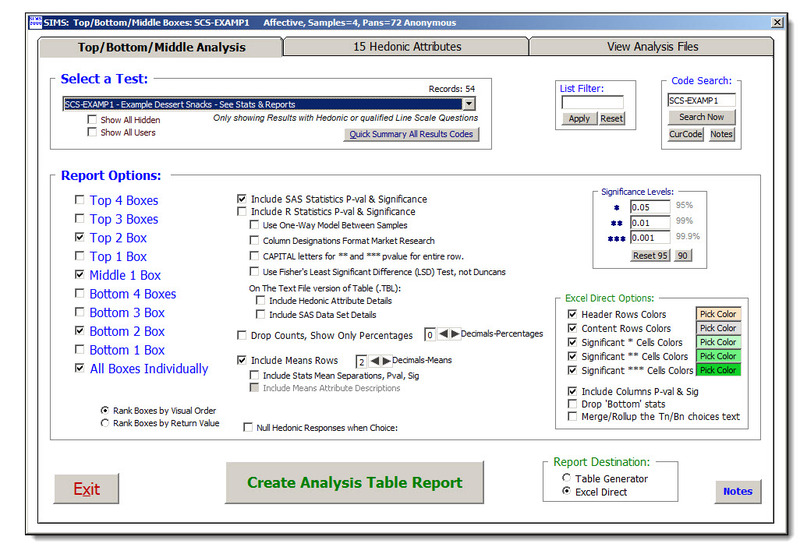 Example SAS Script file used to Generate the Top 2 Boxes Analysis Table. 2. Print Screen of the Generated Analysis Table - Ready for Sending to MS Word. 3. Print Screen of Main Report Selection Form. 4. Print Screen of Main Report Selection Form - Optional Hedonic Question Selection. 4. Text Version of Analysis Table Report also showing with other selected options. 5. Notes that will be available by Clicking the 'Notes' Button on Main Report Form. The Top/Bottom 2 Boxes & 3 Boxes Report summarizes the extreme observations for Hedonic Attributes. using the Top/Bottom 2 Boxes & 3 Boxes percentages as indicators of consumer acceptance. Line Scales, new Top/Bottom Report support for Line Scales, effective update 2016. AND Max - Min  >= 4 (at least 5 categories) AND Max - Min <= 15 (looks like a category scale). The categories for Line Scales will be reported as the actual numeric values on your Line Scale. SIMS can't extract any captions. be unfavorable (Dislike extremely, Dislike very much, etc.). For Horizontal Hedonics, choices should DESCEND from the left answer to the right answer. right ones should be unfavorable (Dislike extremely, Dislike very much, etc.). The Top/Bottom 2 Boxes & 3 Boxes are commonly Ranked by the 'VISUAL' location of the Boxes, Top & Bottom. The Top/Bottom 2 Boxes & 3 Boxes can also be Ranked by the Return 'VALUES' of the Boxes, High & Low. the most common usage, then the report will produce same result with either rank option. Top/Bottom 3 Boxes follow same logic and notes. Top/Bottom 1 Box, and Middle 1 Box are used less often then T2/B2 & T3/B3. Using the scale below, how do you feel about the sample flavor? down to 1 (Dislike extremely). In this example Twelve respondents answered the question for each sample. for Sample 1, while six (50%) selected either of those answers for Sample 2. Hedonic Attribute Selection. By default, all Hedonic Attributes are included in report. You have the option to select individual Hedonic Attributes, one, many, or all. as reported in normal Anova/(Duncan/LS) analysis for each of the hedonic attributes. of '100' is exported to SAS, otherwise a data value of '0' is exported to SAS. Top Two Boxes are defined as being the Top Two SEEN Boxes, Bottom is opposite. on the Sample as the ONLY independent variable. Otherwise the normal default independent variables are Judge and Sample (Two Variables). when there are different sets of respondents testing each sample. - An alternative method sometimes utilized by Market Research professionals. - An alternative method for the analysis reporting 'Letters' for Mean Separations and Column Designation. - Within an Attribute row, a letter indicates the sample is significantly different than the designated column. - Column header for each Sample description is appended with an (a), (b), (c), (etc). Interpretation:  S2 and S3 differ, while S1 and S2, and S1 and S3 do not differ. Where any two sample means that do not share a common letter will differ at some significance level. Only shows the *higher value* cell for Each Pair which is significantly different. Within an Attribute row, a letter indicates the sample is significantly different *higher value* than the designated column. Interpretation:  S2 and S3 differ, S2 is higher value then S3, while S1 and S2, and S1 and S3 do not differ. Selecting this report option could add a few additional pages to your report. 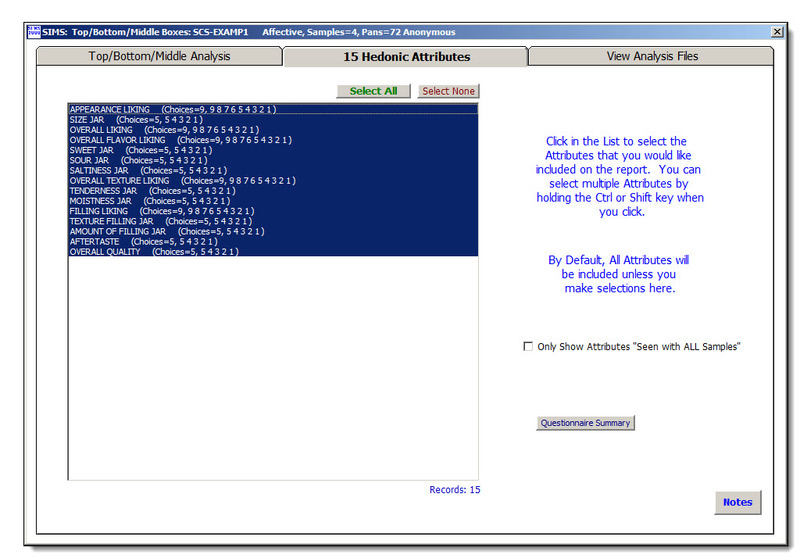 This report option will include ALL the Hedonics SAS Data set Details, Actual and SAS. 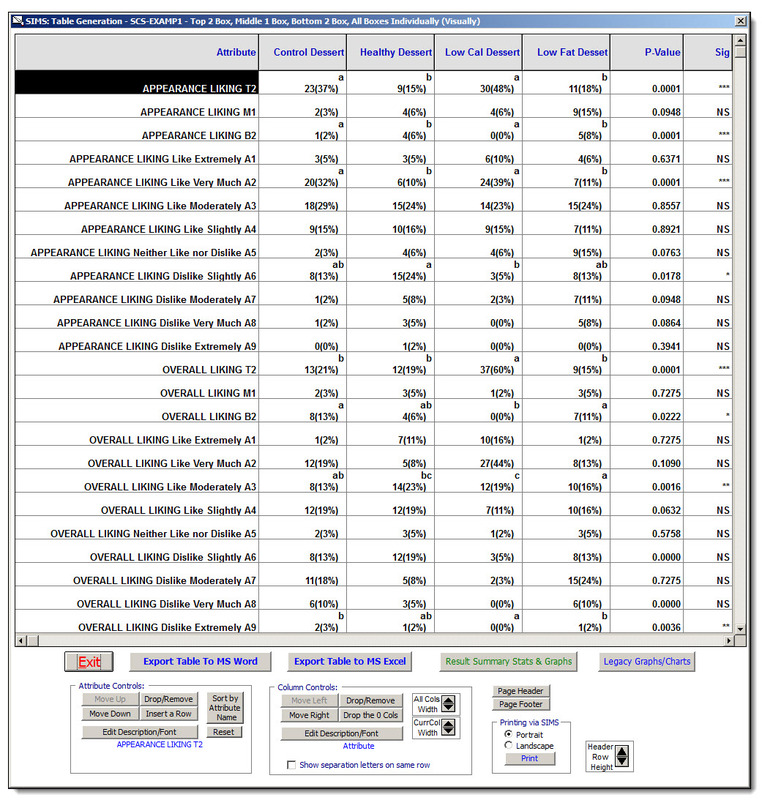 for each Attribute/Sample, and only display the Percentages of panelists. Will include rows of mean score calculations for each Attribute/Sample. These are the means for *ALL* of the data, not just the Top/Bottom Boxes. If this option is desired, you need to run statistical analysis PRIOR to Top/Bottom Boxes, see SIMS Main Menu | Statistical Analysis. The values used for the extra Means Row are from the most previously performed statistical analysis. The mean separation letters will be displayed EXACTLY as it was from the most previous statistical analysis. it is quite likely that you will want the mean separation letter handling to be consistent. What statistical options did you select for this test in SIMS Main Menu | Statistical Analysis? Be consistent. If in doubt, go rerun SIMS Main Menu | Statistical Analysis with your desired options. Significant Cells Colors refers to row cells where the Significance Levels are either '*' or '**' or '***', typically 95% confidance or more. The separation letters will be lower case when Significance Levels are '*', and UPPER case when '**' or '***'. Example:  PVal = .001    Sig = " *** "
Optionaly omit the Bottom 3 & Bottom 2 & Bottom 1 stats from appearing on the report. If selected SIMS will attempt smart text merge, where the 'common' ending choice text words for choices will not be repeated when possible. SIMS adheres to ASTM standards for Rounding Test Data. to Determine Conformance with Specifications'. Clause 6.4 of E29 covers the rounding rules, which go beyond the 5/4 rule. do not change the digit you are keeping. increase the digit you are keeping by 1. And there are non-zero digits beyond it, increase the digit you are keeping by 1. And the digit you are keeping is odd, increase the digit you are keeping by 1. If the digit you are keeping is even, keep it unchanged. Optionally use these files to review what occurred within SAS Statistics. because of the formatting and inclusion of means and percentages included on the final table. Analysis is only available from the Main Tab on TOP2/BOTTOM2 Analysis Screens. where the T2 or B2 in file name indicates Top 2 or Bottom 2 Analysis. where the T3 or B3 in file name indicates Top 3 or Bottom 3 Analysis. where the T1 or B1 or M1 in file name indicates Top, Bottom, or Middle 1 Analysis. or TBM if multiple Top Bottom check box report options are selected. followed by the Tn Bn TBM which applies. Test Combine is not currently supported in the Top/Bottom reports of SIMS2000. It may be possible to combine manually with some time and effort. Export each test report individually to Excel. Use one of the excel spreadsheets to manually edit. Are the Tests Sample numbers Static (2+2=2) or do they Increment Sequentially (2+2=4)? Static, manually combine the Top/Bottom frequencies, recalc the % percentages. Increment, manually copy-n-paste combine insert additional columns. SAS statistics, if needed for Top/Bottom p-value and mean separations. Combine the .dat files, copy/combine .dat file rows into one .dat file. Load and run .sas file using your local PC SAS program natively, i.e. not from SIMS2000. You may need to change the .dat file source name in the .sas file, see /*Read the Data*/ area. Manually locate p-values and mean separations letters from GLM SAS listing file output.